At 4 Weeks of Pregnancy an At Home Test is Not as Accurate as a Blood Test. It is only early days, however week 4 of your pregnancy is when you would normally be expecting your period. If you are pregnant this period may be missed, one of the first signs that you are indeed pregnant. Due to the size of the baby a pregnancy is not generally detectable by ultrasound until about 5 1/2 weeks of pregnancy. A tiny sac can be seen but often is missed by the ultrasound and usually cannot detect the baby and their heart beat. At this very early stage of pregnancy a home pregnancy test is not as reliable as a blood test. A blood test however will detect a hormone referred to as human Chorionic Gonadotropin (hCG) that is secreted when pregnant. This hormone will generally stop you from having your period and can be found in your urine. However, usually even those that are actively trying to fall pregnant will wait until week 5 to confirm and test for pregnancy. Many wonderful changes are happening to you and your body and are the first of many to come on this rollercoaster ride that is pregnancy. The embryo has been implanted and now embedded deeper in the lining of your uterus as the amniotic cavity is forming to make way for the growth of your baby. Light Exercise is Very Beneficial During Pregnancy. The placenta, a very important part of your baby’s support system is forming and will delivery all the nutrients and oxygen that your growing baby requires for the next 8 or so months. From the point you know you are pregnant (and even prior if you have been trying to conceive) you should be considering starting some sort of light exercise. This will not only help with maintaining a healthy weight during pregnancy but also maintain your strength for during labour and regaining your pre pregnancy body. A small amount of exercise is not only great for you but also for your baby. For further information, take a look at our article on Exercise Information, During Pregnancy. Healthy Eating Habits During Pregnancy Should be a Priority. 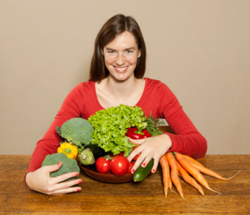 Eating well during pregnancy is also extremely important for not only you but your baby. As soon as you know you are pregnant there will be many changes, the way you eat and what you eat may need to change during pregnancy. There are some foods that are no longer considered safe to eat and can in fact harm your unborn baby. As a guide you may like to take a look at the articles found under “During Pregnancy” on this website. At week 4 of pregnancy the blastocyst, a ball of cells that is dividing in your uterus beginning to transform and is now called an embryo. 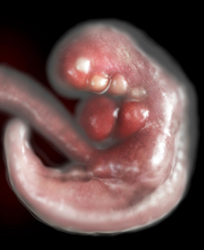 This embryo, your baby is only 1 mm but is already making some huge developments and progress! Over the next five weeks some massive changes will occur and growth is extremely rapid. Already on only day 18 after the conception of your baby, although still very primitive, the spinal cord and brain referred to as the neural tube begin to form. An Embryo at Approximately 4 Weeks of Gestation. As the blastocyst forms into an embryo it will have three different layers all with their own individual types of tissue. Each layer has a very important roll and will eventually form different parts of your baby. The inner layer or endoderm will expand out from chest level at the front of your baby to form a yolk sac. The inner layer of the embryo will eventually form the pancreas, digestive system, lungs and liver. The middle layer will develop into the skeleton, muscles, kidneys, blood vessels and heart that will pump blood around your baby’s body. Last but not least, the outer layer of the embryo will become the skin, hair, nervous system, tooth enamel and lenses of your baby’s eyes. The body stalk (the start of your baby’s umbilical cord) will start to develop from your baby’s waistline and will eventually nourish them when the placenta is complete. For now the yolk sac will provide the nourishment and oxygen your baby needs until the sac is eventually absorbed back into your baby.